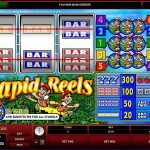 Rapid Reels is another game that is part of a whole series of 3 reels and 5 pay lines video slot games from Microgaming. They are all similar slots but with different symbols, you just need to find the one that is suitable for you. 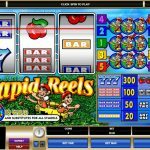 This time we have a game that reminds us of a classic slot machine with cherries and BAR symbols. The graphics are 2 dimensional and the accent is put on the game play, something that many players are looking forward too. Rapid Reels is a game for people who enjoy simpler things. There are no complex bonus features and special symbols here, except for the wild. The wild symbol is one of the most important symbols in this game, the one that can bring more cash to your balance in comparison to other symbols. This game should be played on more coins, because every coin activates different pay lines and the chances to win big is only if you are prepared to take some risks. The reason there are no special features in this slot is because the creators didn`t want to distract you from the real game. Everything you need is right in front of you so you do not have to switch the screen to find out which symbol paid, and how much it paid. 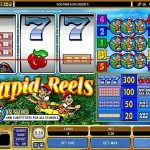 Rapid Reels was created by Microgaming which we have to say are the proud owners of some of the best classic online slots on the market. This is a simple game with retro charm and which offers some really good wins. If you have not played this game before we think you should give it a chance and you will not regret it. Another great example of a classic slot game is Jurassic Jackpot a 3 reel slot by MicroGaming.